Nature lovers searching for a place to escape the sights and sounds of civilization should look no further than Gales Pond County Park. Located right in the center of Oceana County, this largely undiscovered 19-acre park offers a boardwalk, picnic tables and space for family picnics and outings. For those seeking solitude, the winding trails and infrequent visitors create an ambience suited for peaceful reflection and discovery while surrounded by life, harmony and natural scenic beauty. A passion and appreciation for nature can be found in people of all ages, backgrounds and abilities. Challenging trails and long hikes are ideal for some, but others may prefer well-maintained paths and boardwalks with short loops for hikes. Gales Pond County Park offers exquisite sunrises, a handicap accessible boardwalk, exceptional birding, and a nature trail through a variety of unique habitats. Although a feeling of privacy is gained from the lack of visitors, remaining unknown hampers community support and funding for tasks like trail maintenance, installation of duck, bird and bat boxes, and resurrecting the abandoned interpretive signage. So instead of keeping it a secret, share this beautiful natural space with family and friends. In winter, the parking area is rarely plowed and may be inaccessible unless you have a big truck. However, if you are able to arrange a visit when there is snow cover, you won’t be disappointed. The park should be experienced in all seasons to witness the ever-changing landscape and visiting creatures. The boardwalk can get slippery in winter, so be careful. For a spectacle that shouldn't be missed, show up early on a clear, frosty morning before the sun comes up. Shut your car door quietly and then cautiously make your way down the boardwalk to the seating area in the middle of the pond. Best enjoyed with a steaming mug of coffee, watch as the blazing sun slowly rises over the pond to the east. The first rays of morning light paint the water in purple, red and orange as ice crystals glisten on trees and cattails. Early morning birds call out to begin their day. Eventually the warmth reaches your face and eases the biting cold of morning winter air. Resist the urge to spend the time filling up your camera with pictures; live in the moment and experience the view with your own eyes. If you have never explored the trails of Gales Pond County Park, I recommend starting at the trailhead at the west end of the parking area. A boardwalk makes the journey easy, at first easing down a hill toward the cattail marsh, offering an elevated view of the pond through a collection of large beech, pine and hemlock trees. Look for woodpecker holes in the snags (standing dead trees) along the hillside. Nothing goes to waste in nature, a dead tree serves many functions in a forest. Wood-boring insects and fungi begin breaking down a tree before it is fully dead. Woodpeckers, like carpenters tapping on walls to find studs, will tap around on a tree to locate hollow spots where bugs may be found. You can also find damage that humans have left on the beech trees. There is irony in the act of carving a declaration of love into the trunk of a tree. These trees are often older than the knife-wielding lovebirds selfishly chiseling their hearted initials. The engraving that took mere minutes to carve could create a serious wound and infection site, potentially killing a tree that has survived for decades. A better declaration of love would be planting a tree, caring for it, and watching it grow into a sturdy monument to survival against the odds. Upon reaching the bottom of the hill, the boardwalk levels off and turns south, through a curtain of speckled alder and cattails framing the edge of the pond. Take note of the “ecotone” you are passing through, the unique transition zone where biological communities meet and integrate. The upland site you are leaving is home to pine, hemlock, and beech trees while the pond is dominated by a cattail marsh. Speckled alder thrives in the shallow edges of the pond, identifiable by the speckled bark and maroon-colored catkins hanging like pendulums from the branches. Many species of moths and butterflies depend on alder as a primary food source for their caterpillars. Exiting the cover of the alders, the boardwalk heads south across the cattail marsh. Sneak out slowly, it is not unusual to see ducks, cranes, swans and bald eagles. Gales Pond is considered a birding “hotspot” by the Oceana Conservation District in the Birding Guide to Oceana County for being an excellent location for spotting migrant and breeding birds. Crossing over the pond, the boardwalk ends as you enter the woods. Man-made birdhouses, bat houses and duck boxes can be spotted along this side of the pond. White cedar, hemlock, yellow birch, sugar maple and beech trees tower overhead as you stroll along the rolling trails. Take a moment to study the trunks and bark of the surrounding trees. Yellow birch can be identified by the shiny yellow-bronze bark that peels off in horizontal strips. American hornbeam earns the common name “musclewood” from the grooved trunks and branches that resemble muscled limbs. Without leaves on trees, identification is limited to studying bark, twigs, and leaf scars. On the ground along the edges of the path, American wintergreen is still holding onto its fragrant evergreen leaves. 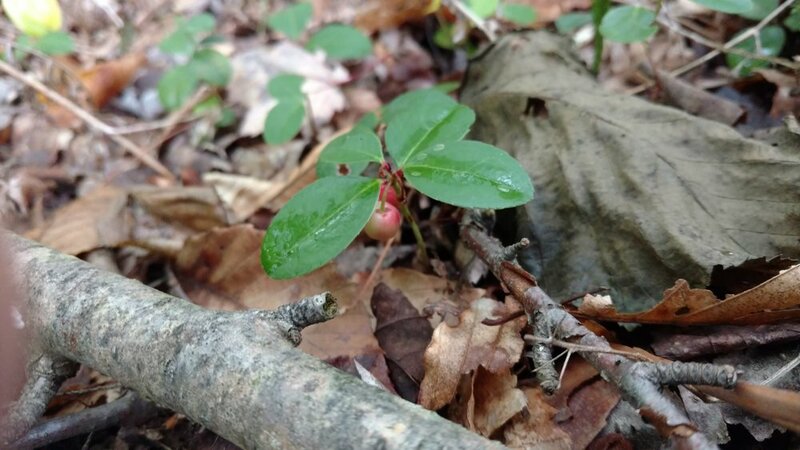 Some red wintergreen berries persist into winter, offering a dependable food source for white-tailed deer, turkey, squirrels and grouse. Break a couple leaves in your hands and smell the wintergreen as you continue down the path. Keep an eye out for an odd pair of trees growing out of an old rotting stump. This is known as a “nurse log” or “nurse stump.” Two trees growing side-by-side, their trunks meeting at the base in what might appear to be a multi-stem tree at first glance. However, these are two distinct species of trees that happened to share the same “nurse log” to germinate and grow. A rotting stump provides an optimal substrate for young tree root systems. The soft, moist wood offers water, nutrients, and added height to reach sunlight. Over time, the nurse log rots away leaving a void between the roots, appearing to grow on stilts. Here and there, lycopodium can be seen poking through the snow. 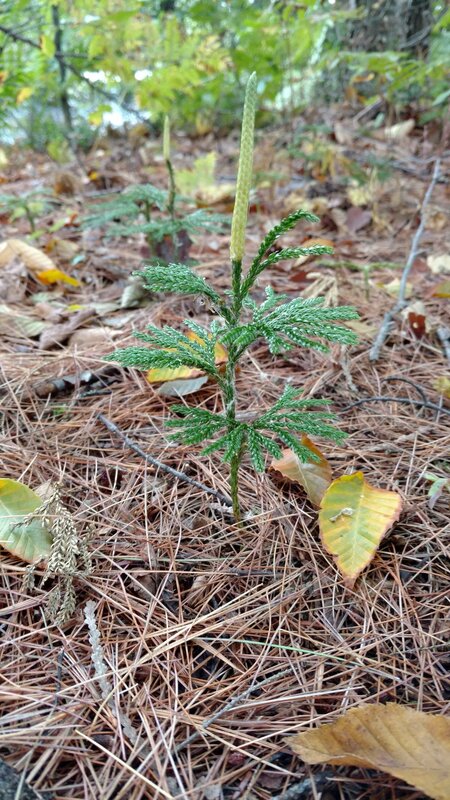 Also called tree club moss or ground pine, this club moss resembles a very small pine tree topped with a golden candle. Spores taken from the strobili were once used in photography flash bulbs. Farther along the path a wooden bridge crosses over the creek. This is a great spot to look for tracks in the snow and mud where nearby creatures come for a drink. Be careful on the steep side of the bridge as it can become slippery. After crossing the bridge over the creek, the trail soon descends into a hardwood-conifer swamp made up of yellow birch, white cedar, alder and hemlock. 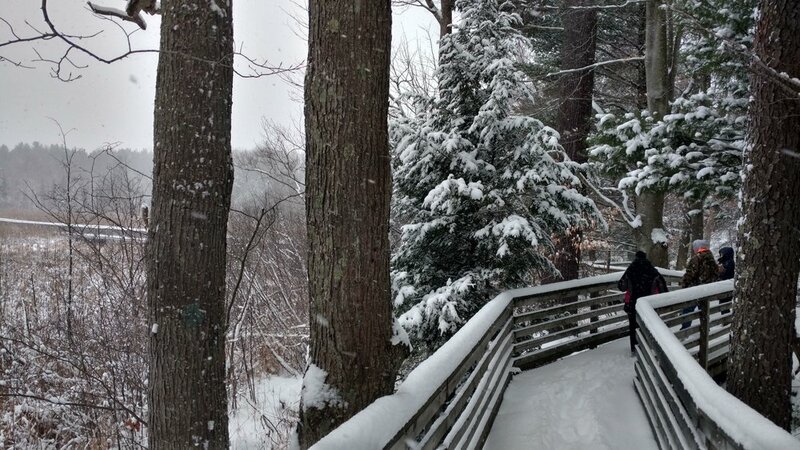 A raised boardwalk leads us through wet and uneven terrain not easily traversed by foot. In spring, this area blooms with colors of countless ephemeral wildflowers. Snags precariously tower in the wet forest, dotted with woodpecker holes. Fluctuating water levels and windthrown trees create an ever-changing landscape and a hummocky forest floor covered with a thick layer of vegetation and woody debris. Removal of downed woody debris is strongly discouraged as this could interrupt the viability of the ecosystem. Rotting logs and stumps provide the medium necessary for the germination of tree seedlings and healthy forest regeneration. Many animals depend on the thick vegetation for cover including birds, mice, rabbits, snakes, turtles and frogs. At the end of the boardwalk, the trail rises into an upland forest of hemlock, maple, beech, aspen and black cherry trees. Notice the defunct interpretive trail markers along the path. Plans are underway to revamp this educational feature in the future. The trail twists through the trees before exiting onto Filmore Road. Until recently, the trail continued on the north side of the road, but that is now private property. Your options are either to backtrack and follow the trail back to the parking area, or exit the path onto the road, turn left and follow the road back to the parking area. Be very careful of cars if you choose this route. There isn’t much traffic, but curves limit the vision of drivers and pedestrians. On the north side of the road and west of the dam, there is a sign displaying the history of Gales Pond and a few picnic tables available for public use. We are fortunate to have a park like Gales Pond County Park available for public use in our county. With all of the attention focused on our beautiful Lake Michigan shoreline, inland parks can easily be forgotten. Enjoyable in any season, the park should be experienced at all times of the year. I use the park for writing inspiration, birdwatching, and relaxing walks. 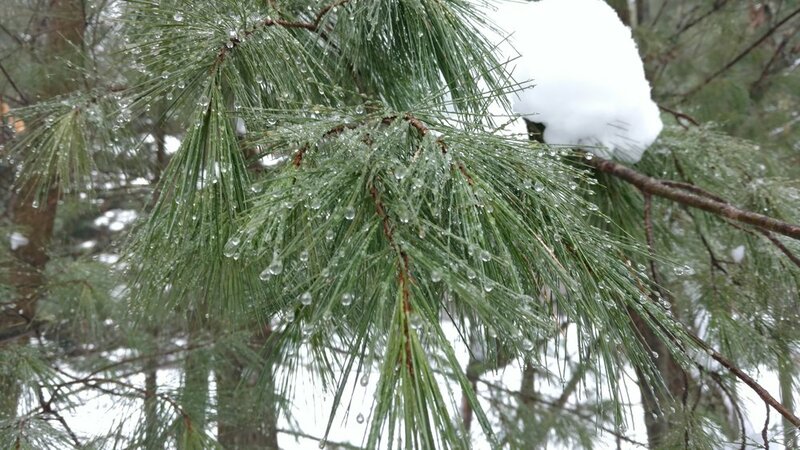 Oceana Conservation District utilizes Gales Pond for a variety of educational events including birding talks, guided forest walks, an annual 6th grade field trip welcoming students from local schools, and a Nature Day Camp for children ages 5-10 years old. I occasionally pass other visitors on the paths and I am happy to see a variety of ages and interests. I’ve seen people snapping countless cell phone pictures and selfies, other people quietly strolling or sitting enjoying the moment. However you choose to enjoy the park, be respectful of other visitors and of the park itself. Not every community has public access to a place like Gales Pond. We should appreciate the park and help to protect and enhance it for the future.